Clare Island, Co. Mayo, Ireland. 10 Sep 2002. Fabio Rindi. © Michael Guiry (mike.guiry@nuigalway.ie). Clare Island, Co. Mayo, Ireland. 10 Sep 2002. Fabio Rindi. © Fabio Rindi (f.rindi@univpm.it). Upper Canal Road, Galway City, Ireland. 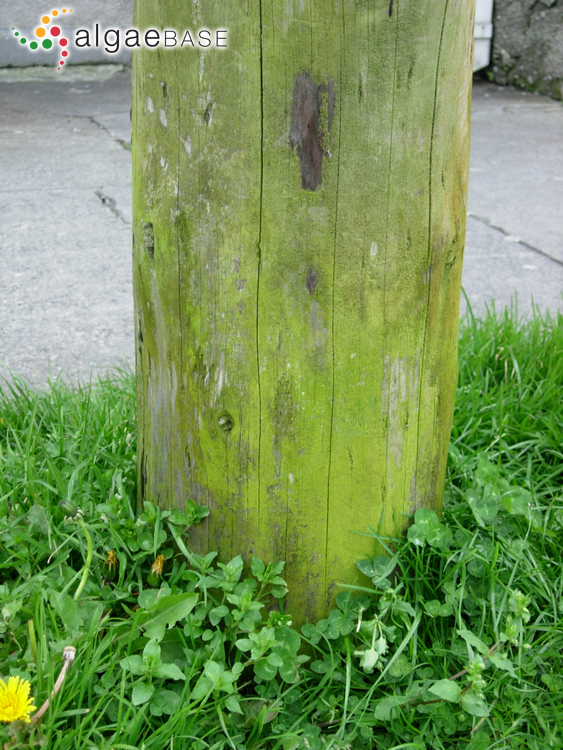 Forming green coating at the base of electricity pole. 24 Apr 2005. Fabio Rindi. © Fabio Rindi (f.rindi@univpm.it). Published in: Laundon, J.R. (1985). Desmococcus olivaceus - the name of the common subaerial green alga. Taxon 34: 671-672. The type species (holotype) of the genus Desmococcus is Desmococcus vulgaris F.Brand. Broady, P.A. & Ingerfeld, M. (1993). Three new species and a new record of chaetophoracean (Chlorophyta) algae from terrestrial habitats in Antarctica. European Journal of Phycology 28: 25-31, 9 figs. Ettl, H. & Gärtner, G. (1995). Syllabus der Boden-, Luft- und Flechtenalgen. pp. i-vii, 1-721. Stuttgart: Gustav Fischer. Gustavs, L., Gors, M. & Karsten, U. (2011). 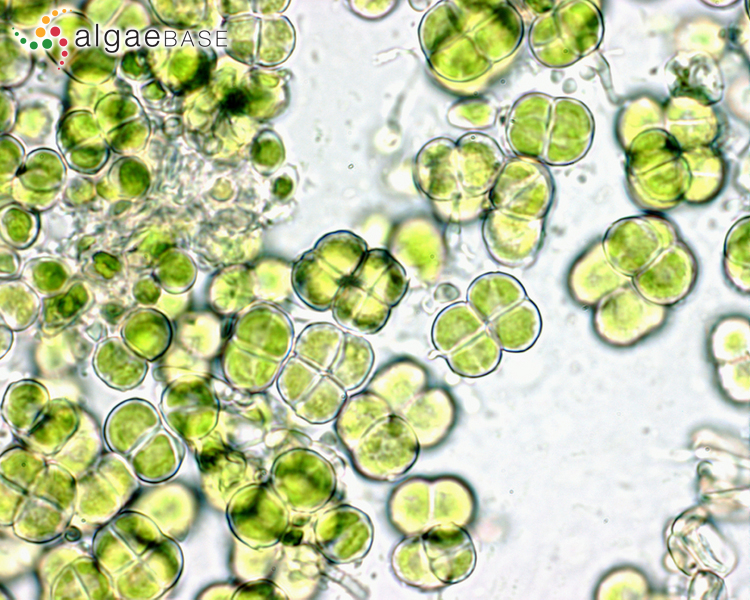 Polyol patterns in biofilm-forming aeroterrestrial green algae (Trebouxiophyceae, Chlorophyta) (Note). Journal of Phycology 47(3): 533-537. John, D.M. (2011). Phylum Chlorophyta. Orders Chaetophorales, Microsporales, Ulotrichales. In: The freshwater algal flora of the British Isles. An identification guide to freshwater and terrestrial algae. Second edition. (John, D.M., Whitton, B.A. & Brook, A.J. Eds), pp. 524-554. Cambridge: Cambridge University Press. Rindi, F. & Guiry, M.D. (2004). Composition and spatial variability of terrestrial algal assemblages occurring at the bases of urban walls in Europe. Phycologia 43: 225-235. Tsarenko, P.M. (2011). Trebouxiophyceae. 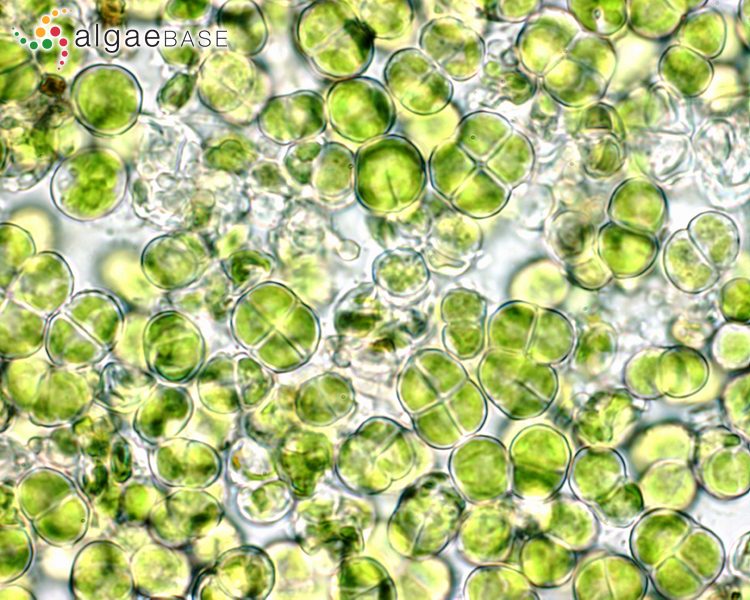 In: Algae of Ukraine: diversity, nomenclature, taxonomy, ecology and geography. Volume 3: Chlorophyta. (Tsarenko, P.M., Wasser, S.P. & Nevo, E. Eds), pp. 61-108. Ruggell: A.R.A. Gantner Verlag K.-G..
Accesses: This record has been accessed by users 7727 times since it was created. Laundon, J.R. (1985). 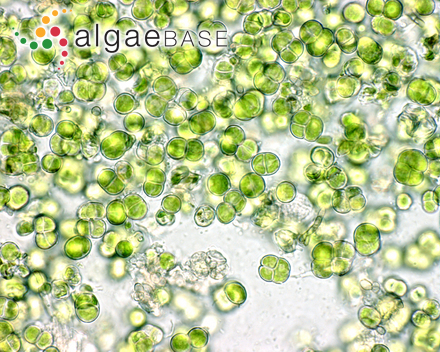 Desmococcus olivaceus - the name of the common subaerial green alga. Taxon 34: 671-672.